Kinect Star Wars Review: Is the Force with You? Starting today, Stars Wars fans have an opportunity to live out their dreams of wielding a Lightsaber with the release of Kinect Star Wars for Xbox 360. Through the use of Xbox’s controller-less technology, you can train to become a Jedi, go head to head in a Lightsaber duel, Pod Race and dance for your life in front of Jabba the Hutt—all with your body as the controller. 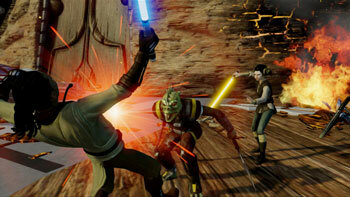 The core of the Kinect Star Wars game centers around events that take place following Episode I: The Phantom Menace. Initially starting on the Wookie planet (yes, Chewbacca is there! ), you join other Padawan students learning to become Jedis. Your brief training gets put into practice when the planet is invaded by the lizard-like Trandoshans (if you’re a Star Wars fan, you’ll recognize these creatures as one of the bounty hunters Darth Vader uses in Episode IV). You’ll battle through different worlds and characters all familiar to fans who have watched the movies. 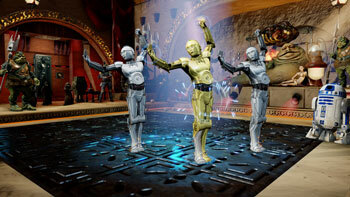 The fun starts with your hosts C-3PO and R2-D2 who narrate the game. Stop for a bit without making a selection or walk out of the room, and you’ll see C-3PO make quips and start doing things like “the robot” dance move. The games are for one or two players at a time, and you can step in and out of game play and the Kinect will recognize each player and adjust the screen appropriately. In the case of games that require you to wield a Lightsaber, you can raise whichever hand you want to have it placed in. Your other hand will wield the power of “the force” for Force Push moves. Kinect Star Wars is rated T for Teen by the ESRB for Mild Language, Mild Suggestive Themes, and Violence but if your younger children have seen the movies, or own the LEGO sets, or have the Pottery Barn bedroom set, or have dressed as a Star Wars character for Halloween, then this is the IT game of the season. Kinect Star Wars retails for $49.99 on Amazon.com . Yoda is my fav but Mace has to be my second I want his Lightsaber but his Purple blade is too faded.